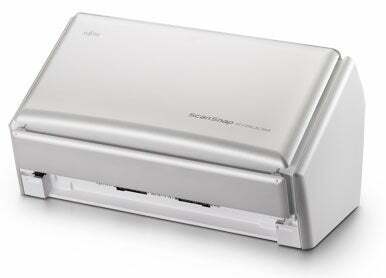 Fujitsu’s ScanSnap S1500M is an easy to use, attractive sheet-fed scanner. Its automatic document feeder can hold up to 50 sheets, and it can scan both sides of a document simultaneously at a resolution of 600 dpi. The compact silver and white S1500M is solidly built and connects to your Mac via USB 2.0. Its fold-up design allows it to take up little desktop real estate when not in use. Fujitsu’s ScanSnap Manager software offers a colorfully pleasing interface, with intuitive controls and easy to recognize icons. The S1500M doesn’t ship with a TWAIN driver, which would let you initiate a scan from Snow Leopard’s built in applications like Image Capture and Preview, or into TWAIN compliant apps like Acrobat Professional 8, a powerful, and expensive, application which the Scan Snap actually includes. You can, however, use the ScanSnap Manager to send the scanned files to these applications. The ScanSnap Manager software comes with presets for scanning to a printer, to a folder, or to e-mail. The ScanSnap Manager also shows presets for two bundled applications, CardIris business card scanning software, and Abbyy Fine Reader. The CardIris software worked fine, though a bit of editing cleanup was required. Two of the Abbyy presets, Scan to Word and Scan to Excel, did not work under Snow Leopard during the testing for our April 2010 print issue. We called Fujitsu representatives and pointed me to their Snow Leopard update. I downloaded the ScanSnap update, but still had problems. Fujitsu told me they’d look into the problem. Before posting the online version of this review, I went back to check on updates and found an Abby FineReader for ScanSnap update for Snow Leopard. After downloading the update, version 4.2, up from version 4 that came with the scanner, the software worked exactly as you’d expect. In terms of speed, the ScanSnap wasn’t the fastest document scanner we’ve tested, but was still impressively quick, taking just 36 seconds for our 10-page test and 18 seconds for our scan to Acrobat test. Its one-page test result, at 17 seconds, was the slowest score of four recently tested document scanners, which had scores between 7 and and 15 seconds. In our scanning quality tests, we found the S1500M to be a solid performer, earning Good ratings in all three of our evaluation categories (detail, color and OCR accuracy). For those looking to reduce the amount of paper in their life, the space-saving, easy to use ScanSnap S1500m offers competitive price and solid performance.